The theme at this boutique hotel is travel. The lobby is decorated with paraphernalia from all over the world and the elevator is adorned with a world map. Smoke free premises. 161 units. 9 stories, interior corridors. Accessibility (Call). 0.5 mi w of Union Square; between Hyde and Larkin sts. 1075 Sutter St 94109. Station: Powell Street. 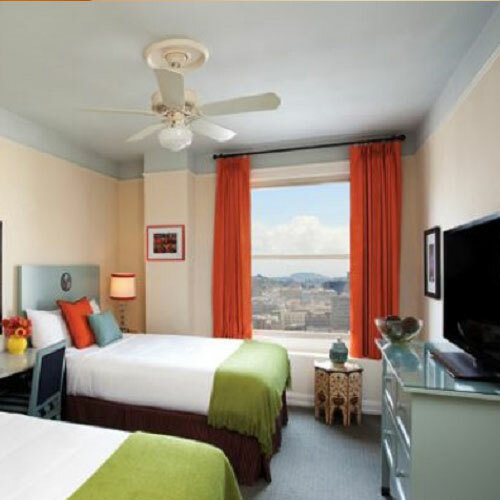 The State of California Green Lodging Program recognizes lodgings that have developed sustainability practices to minimize waste and conserve energy and natural resources. Energy Star is a government-backed program helping businesses protect the environment through superior energy efficiency. The U.S. Green Building Council's LEED rating system provides independent, third-party verification that a building meets the highest green building and performance measures. no A/C, coffeemakers, wireless Internet, safes. Some: refrigerators, microwaves.